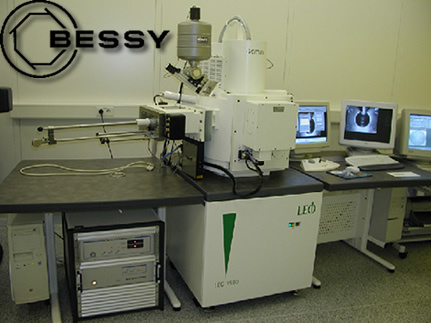 NanoMaker was integrated with laser interferometer controlled stage mounted on scanning electron microscope LEO 1560 at BESSY II (Germany). The interferometer controlled X-Y laser stage from Technology Sources has 150mm travel limits with positioning resolution of 2.5 nm. Using the NanoMaker unique features of exposure fields stitching based on dynamic compensation and high resolution interferometer stage, new setup gives a demonstration of excellent results in production of large-scale devices (up to a few centimeters). 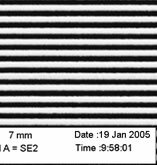 On the photos below there are two examples of such devices for X-ray optics and spectroscopy. Figures 2a. and 2b. 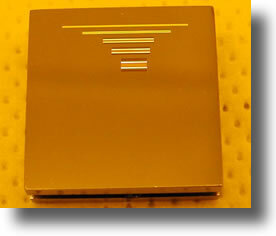 demonstrate Ge single crystal monochromator with a gold reflection zone plates. 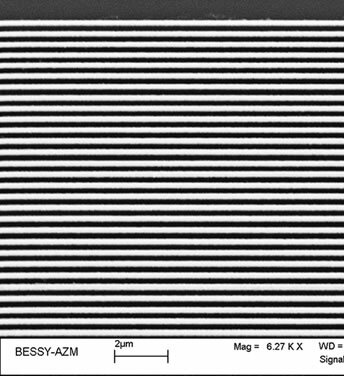 Figure 3. presents fragments of elliptical Bragg-Fresnel zone plate. All photos have been courteously given by , BESSY II, Berlin. Fig. 2a. Several lenses fabricated on the same Ge (111) single crystal monochromator as a gold reflection zone plates. Ge crystal has a dimensions of 30 mm by 30 mm. Focus distances of lenses are 310 centimeters. Last zone size is 300 nanometers. Fig. 2b. 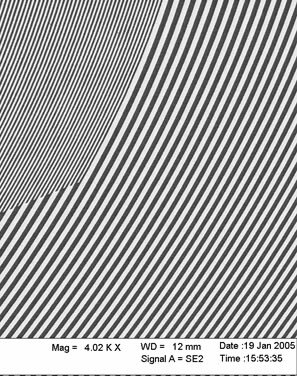 Fragment of the last zones of one lens. 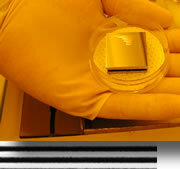 Thickness of a gold phase shifting layer is equal to 150 nm. Fig. 3. 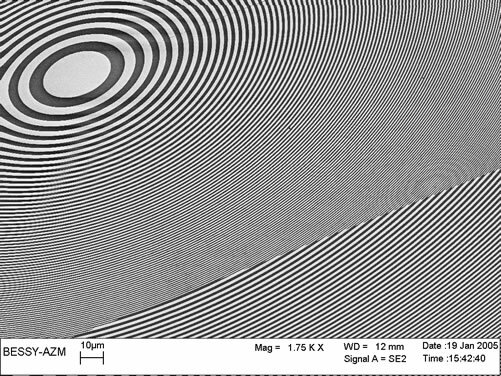 Fragments of elliptical Bragg-Fresnel zone plate with 1st and 3rd order zones designed for X-ray optics.